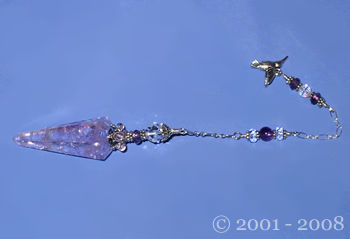 I have always been fascinated with pendulums and somewhere around 1998 I started designing and creating One of a kind Pendulums for those who prefer something unique. 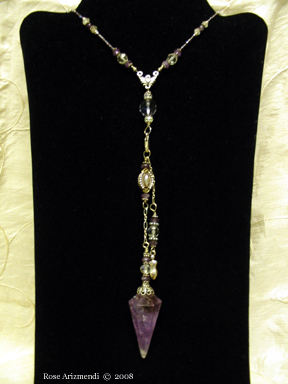 I began selling these beautiful collector pendulums to friends and then later on sold them in local specialty shops featuring handcrafted jewelry and such. Currently, I am creating a new series of Pendulums and will post these here when I am finished. 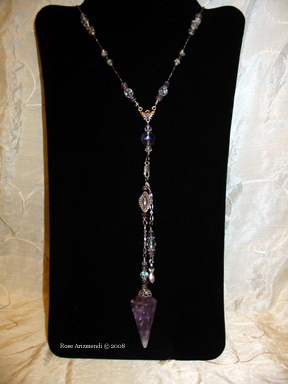 Below are a few sample photographs of some of the Pendulums and Pendulum Necklaces I have created over the years. If you are interested in purchasing a Custom Made Pendulum please contact me. We accept paypal. 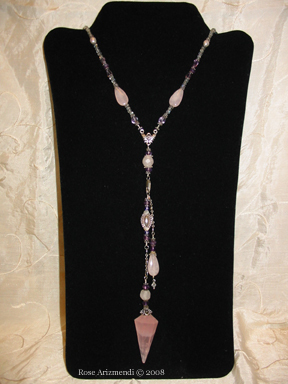 A stunning rose quartz Egyptian pillar pendulum with gemstone beads of amethyst, rose quartz, glass beads, sterling silver chain, bead cap, and wire. This piece is enhanced with a lead free pewter dragonfly charm and spacers. 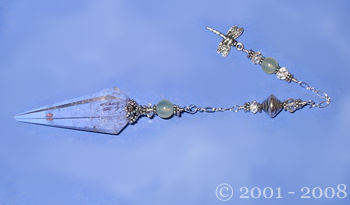 A faceted quartz crystal pendulum with gemstone beads of quartz crystal, serpentine, sterling silver bead, chain, bead cap, and wire. 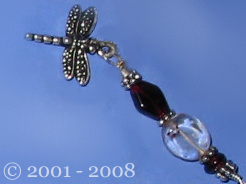 This piece is enhanced with a lead free pewter dragonfly charm and spacers. 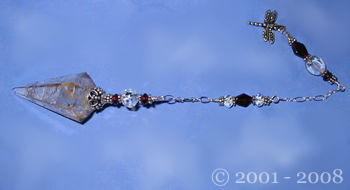 A lovely faceted citrine pendulum with gemstones of garnet, citrine, sterling silver chain, bead cap, and wire. This piece is enhanced with a magical lead free pewter dragonfly charm and spacers. I created the Pendulum Necklaces below with a detachable pendulum. The beauty of these pieces is you can wear your pendulum as a necklace and if you want to use the pendulum at any time, you simply release the pendulum from the necklace section and reattach it when your done.